This book is something I wouldn't normally pick up. But I wanted to know her story. 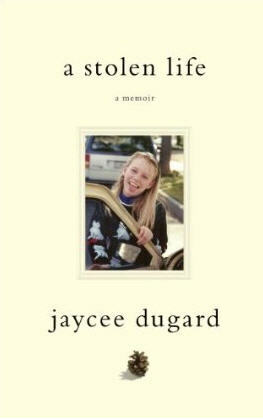 I wanted to know Jaycee Dugard's story in her own words. The first thought that came to my mind since page one was "What a strong woman." I remember reading in a magazine about her spending 18 years in captivity. And when you read or hear that, it takes a while for your mind to process it, 18 years is a long time. And she endured it, had two kids in the process and she survived. When reading this book, I constantly had to remind myself that this wasn't fiction, that this was real. That all of the things in the book, especially in the first chapters, actually happened to a little girl. Some part of me wanted to believe it was all fiction, because then my stomach wouldn't turn whenever this man abused her. It seemed unreal to me that a person, especially at her young age, could survive all of that torture. But you see the way she writes and you have to believe it. I believed it. This girl had so much strength. Thinking about her story makes my stomach turn. Thinking about her being taken at such an innocent age, losing all those years, about her mother. It's all a swirl of emotions, even tears, I felt angry at Garrido, scared for Jaycee and her family, and generally angered at the world. I asked questions to myself like: why her? Why are people like Phillip Garrido allowed to live in this world. Why didn't anyone ever notice, 18 years and nobody did. And that was just a reader's reaction, I couldn't even begin to imagine how Jaycee Dugard felt. That's another thing, the whole book there's one thought that crossed my mind and everyone else's I'm sure. "If I were in that situation I would...." But that's the thing, it didn't happen to me, or you, just to her. And she found a way to survive it, in her own way, but she did. And in the end that's what counts. Jaycee Dugard found a way to survive and never lost hope. This book really makes you think, if Jaycee survived 18 years of captivity with a psycho, then why is it so hard for people who have normal lives to deal with every day things. From now on one phrase will always cross my mind. Jaycee Dugard survived those horrors, I can survive whatever's going on in my life.